To be honest, I'm of two minds when it comes to using open source on closed platforms. I prefer to work on the open side of the fence, but I also understand you can't always do that. Especially at the dreaded day job or when you're working onsite as a contractor. You have to use the hardware your employer supplies. Over the last few years, I've used a MacBook Pro at the office. When I'm in these types of situations, I try to load as much open source software on my office computer as I can without drawing the ire of the IT department. One open source tool I depend on when using MacOS is nvALT. It's a note-taking tool based on the popular Mac app Notational Velocity. NvALT brings much-needed minimalism and simplicity to taking notes. You write your notes in plain text, and it's quick and easy to use. That's as easy as downloading and installing the software. When you start it up, you'll notice that there's nothing visually exciting about nvALT. In fact, it's quite plain. With nvALT, function supersedes form. The top pane contains a list of notes. Obviously, it will be empty when you first start it. The bottom pane contains the body of your note. You create a note by typing its title in the Search or Create box at the top of the window. Then press Enter. nvALT offers quite a few features. The main ones I want to look at are tagging, searching, and previewing notes. Tagging adds one or more keywords to a note. That keyword makes it easier to find a specific note. Why should that be a problem? nvALT doesn't understand the idea of folders (like the ones you use on your computer or in a tool like Dropbox). To tag a note, double-click in the Tags column for a note. Then type the tag you want to add to a note—for example, blogging. You can sort your notes by their tags by clicking the header or the Tags column. From there, scroll through to find a note. 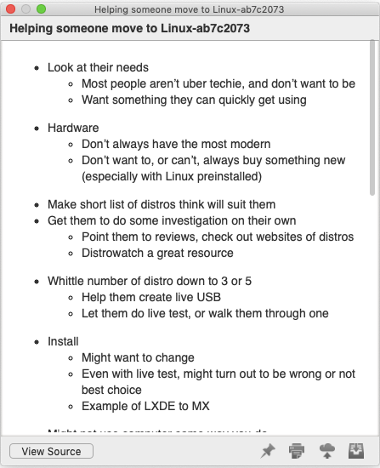 As I mentioned a moment ago, nvALT stores notes in a long list. There are no folders nor any way to organize your notes other than with tags. But you can search for notes. To do that, type words that might be in the title or body of your note in the Search or Create box at the top of the nvALT window. Depending on how many notes you have, you may still wind up with a list of notes, but using the search function narrows that list considerably. 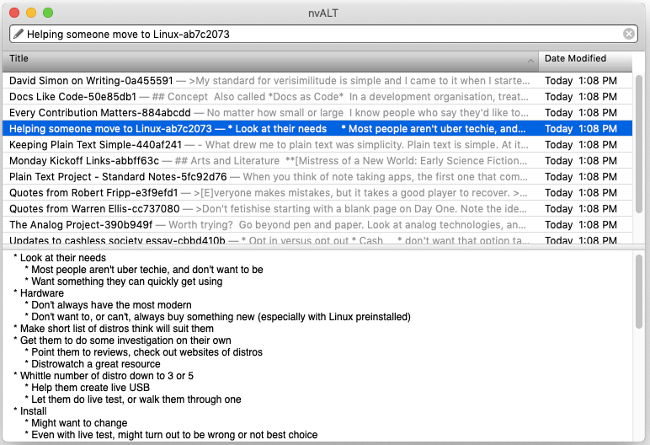 I mentioned previews a few paragraphs ago when talking about nvALT's support for Markdown. The preview gives you a nicely rendered version of a note. To preview a note, select Preview > Toggle Preview Window. You can save the preview as an HTML file or copy and paste the HTML by clicking View Source. There are a few other useful features that make nvALT a bit more flexible. One is the ability to export your notes as plain text, HTML, rich text format (RTF), or as a Word document. Do that by selecting Note > Export. You can also save a note as a PDF file by selecting Preview > Print Preview / PDF. nvALT saves your notes in the Library/Application Support/Notational Data folder on your computer. You can decide how you want those notes saved by selecting nvALT > Preferences and clicking the Storage tab. From there, select an option from the "Store and read notes on disk as" list. You can save your notes in a single database, as individual plain text files, as formatted HTML files, or as RTFs (which saves all the formatting and makes pulling your notes into a word processor easier). 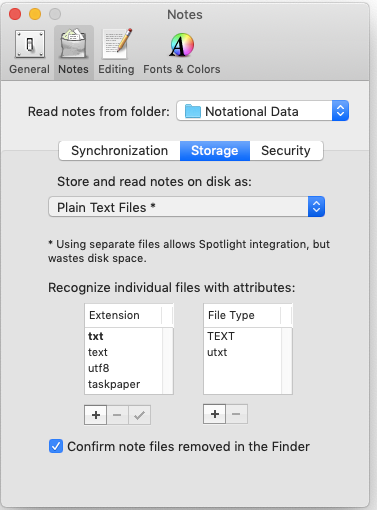 I find that the latter three options are useful if you want to back up or share individual notes. Whenever I have to use a MacBook at the day job, I find nvALT to be very useful. I probably don't take advantage of all its features. What I do use works well enough for me. It's a simple, fast, and effective way to take and store notes. This article first appeared, in a slightly different form, at The Plain Text Project and appears here via a Creative Commons Attribution 4.0 International License.